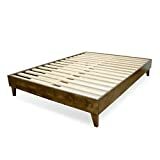 Are you sleeping on an old mattress that isn’t as comfortable as it once was? Or perhaps you were never terribly impressed with your mattress and you’ve been thinking about coughing up some cash and getting a new one. Before you go out and spend a small fortune on a new mattress, Amazon has a one-day sale going that you should definitely take advantage of. 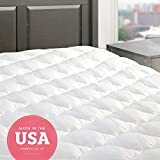 The eLuxurySupply Five Star Mattress Pad with Fitted Skirt is one of the best-rated mattress toppers on the entire Amazon site, and it’s getting deep discounts today on Amazon. Every size is on sale today, from Twin and Full to Queen and King. Definitely give one a try before you shell out money for a new mattress — you’ll be shocked at how comfortable your current mattress can be with the right topper. Also of note, the same company is offering an on-site coupon you can clip that will save you $24 on its top-rated platform bed frame in every available size.